It is very important to follow the label directions when using any chemical cleaner or polish. Read all warning and caution statements that appear on the label. To help protect your vehicle’s finish from rust and deterioration, wash it thoroughly and frequently at least once a month with lukewarm or cold water. If you use your vehicle for off-road driving, you should wash it after each off-road trip. Pay special attention to the removal of any accumulation of salt, dirt, mud, and other foreign materials. Make sure the drain holes in the lower edges of the doors and rocker panels are kept clear and clean. Insects, tar, tree sap, bird droppings, industrial pollution and similar deposits can damage your vehicle’s finish if not removed immediately. Even prompt washing with plain water may not completely remove all these deposits. A mild soap, safe for use on painted surfaces, may be used. After washing, rinse the vehicle thoroughly with lukewarm or cold water. Do not allow soap to dry on the finish. Do not use strong soap, chemical detergents or hot water, and do not wash the vehicle in direct sunlight or when the body of the vehicle is warm. Be careful when washing the side windows of your vehicle. Especially, with high-pressure water, water may leak through the windows and wet the interior. To prevent damage to the plastic parts and lamps, do not clean with chemical solvents or strong detergents. After washing the vehicle, test the brakes while driving slowly to see if they have been affected by water. If braking performance is impaired, dry the brakes by applying them lightly while maintaining a slow forward speed. 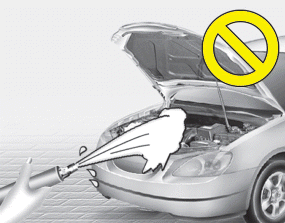 Water washing in the engine compartment including high pressure water washing may cause the failure of electrical circuits located in the engine compartment. Wax the vehicle when water will no longer bead on the paint. Always wash and dry the vehicle before waxing. Use a good quality liquid or paste wax, and follow the manufacturer’s instructions. Wax all metal trim to protect it and to maintain its luster. Removing oil, tar, and similar materials with a spot remover will usually strip the wax from the finish. Be sure to re-wax these areas even if the rest of the vehicle does not yet need waxing. Wiping dust or dirt off the body with a dry cloth will scratch the finish. Do not use steel wool, abrasive cleaners, or strong detergents containing highly alkaline or caustic agents on chrome-plated or anodized aluminum parts. This may result in damage to the protective coating and cause discoloration or paint deterioration. Deep scratches or stone chips in the painted surface must be repaired promptly. Exposed metal will quickly rust and may develop into a major repair expense. If your vehicle is damaged and requires any metal repair or replacement, be sure the body shop applies anti-corrosion materials to the parts repaired or replaced. To protect the surfaces of brightmetal parts from corrosion, apply a coating of wax or chrome preservative and rub to a high luster. Corrosive materials used for ice and snow removal and dust control may collect on the underbody. If these materials are not removed, accelerated rusting can occur on underbody parts such as the fuel lines, frame, floor pan and exhaust system, even though they have been treated with rust protection. Thoroughly flush the vehicle underbody and wheel openings with lukewarm or cold water once a month, after off-road driving and at the end of each winter. Pay special attention to these areas because it is difficult to see all the mud and dirt. It will do more harm than good to wet down the road grime without removing it. The lower edges of doors, rocker panels, and frame members have drain holes that should not be allowed to clog with dirt; trapped water in these areas can cause rusting. The aluminum or chrome wheels are coated with a clear protective finish. Do not use any abrasive cleaner, polishing compound, solvent, or wire brushes on aluminum or chrome wheels. They may scratch or damage the finish. Clean the wheel when it has cooled. Avoid washing the wheels with high-speed car wash brushes. Do not use any alkaline or acid detergent. It may damage and corrode the aluminum or chrome wheels coated with a clear protective finish. By using the most advanced design and construction practices to combat corrosion, we produces cars of the highest quality. However, this is only part of the job. To achieve the longterm corrosion resistance your vehicle can deliver, the owner's cooperation and assistance is also required. Road salt, dirt and moisture that is allowed to accumulate underneath the car. Removal of paint or protective coatings by stones, gravel, abrasion or minor scrapes and dents which leave unprotected metal exposed to corrosion. If you live in an area where your car is regularly exposed to corrosive materials, corrosion protection is particularly important. Some of the common causes of accelerated corrosion are road salts, dust control chemicals, ocean air and industrial pollution. Moisture creates an atmosphere that both promotes and facilitates corrosion. For example, corrosion is accelerated by high humidity, particularly when temperatures are just above freezing. In such conditions, the corrosive material is kept in contact with the car surfaces by moisture that is slow to evaporate. Mud is particularly corrosive because it is slow to dry and holds moisture in contact with the vehicle. Although the mud appears to be dry, it can still retain the moisture and promote corrosion. High temperatures can also accelerate corrosion of parts that are poorly ventilated against moisture disperal. It is particularly important to keep your car clean and free of mud or accumulations of other materials. This applies not only to the visible surfaces but particularly to the underside of the car. The best way to prevent corrosion is to keep your car clean and free of corrosive materials. Attention to the underside of the car is particularly important. If you live in a high-corrosion area where road salts are used, near the ocean, areas with industrial pollution, or acid rain, etc., you should take extra care to prevent corrosion. In winter, spray or rinse the underside of your car at least once a month and be sure to clean the underside thoroughly when winter is over. When cleaning underneath the car, give particular attention to the components under the fenders and other areas that are hidden from view. Do a thorough job; just dampening the accumulated mud rather than washing it away will accelerate corrosion rather than prevent it. Water under high pressure and steam are particularly effective in removing accumulated mud and corrosive materials. When cleaning lower door panels, rocker panels and frame members, be sure that drain holes are kept open so that moisture can escape. If these areas are not kept clear, moisture could become trapped and accelerate corrosion. Don't park your car in a damp or poorly ventilated garage. This creates a favorable environment for corrosion. This is particularly true if you wash your car in the garage or drive it into the garage when it is still wet or covered with snow, ice or mud. Even a heated garage can contribute to corrosion unless it is well ventilated so moisture can dispersed. Scratches or chips in the finish should be covered with "touch-up" paint as soon as possible to reduce the possibility of corrosion. If bare metal is showing, the attention of a qualified body and paint shop is recommended. Bird droppings : Bird droppings are highly corrosive and may damage painted surfaces in just a few hours. Always remove bird droppings as soon as possible. Moisture can collect under the floor mats and carpeting to cause corrosion. Check under the mats periodically to be sure the carpeting is dry. Use particular care if you carry fertilizers, cleaning materials or chemicals in the car. These should be carried only in proper containers and any spills or leaks should be cleaned up, flushed with clean water and thoroughly dried.